And a shot of the pair. I’m really happy with how these turned out. I pretty much followed the pattern as written, but I did exclude two tiers from the legs. That gave the socks perfect length, not too long or short. If I had knit these two extra tiers, the cuffs would’ve topped the sock blockers. The pattern was easy to follow and I like the results, especially for challenging variegated/stripy yarn. 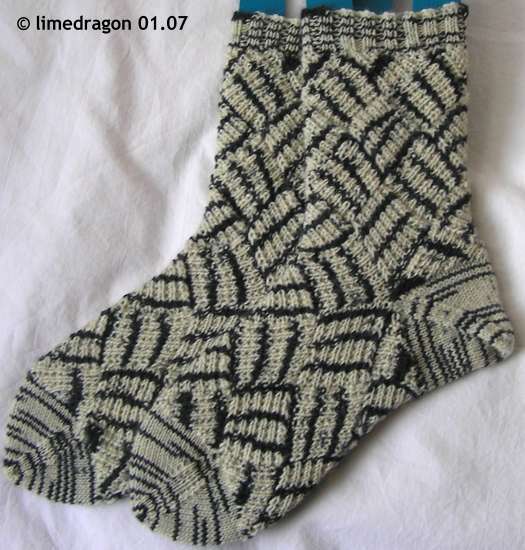 Mom has mentioned twice already how she likes them so I may use this pattern again to knit some socks for her. I had originally planned to limit the entrelac to the legs only, but as you can tell, I kept going through the instep. I tested them before washing, and I couldn’t really feel the “seams” where you pick up stitches for each section. Moreover, I’m happy I found such a good match for the Zebra yarn. There’s only two small things I would change. The toe and afterthought heels in the pattern are quite pointy, decreasing down to a total of 16 stitches (8 across). You can see how square the heels are, because of this. Next time, instead of an afterthought heel, I would like to try a short-row heel. 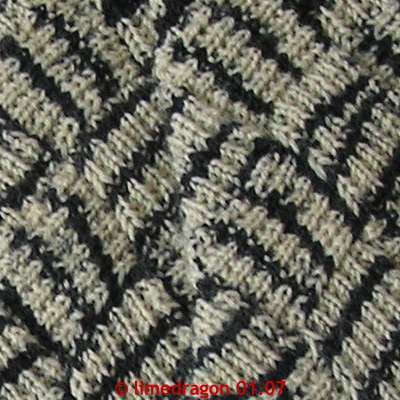 The entrelac layout given in the pattern benefits this type of heel equally well. Just knit the short-row heel where you would put in the waste yarn. I did have a problem with ladders before the SSKs on the toes and heel. (You might be able to see it in the picture above; click for bigger.) I’ve had this problem before, but it went away for a long while. Now it’s back; I think I’m over-compensating with my tension. Maybe it’s just the yarn�my gauge seemed a bit looser with the zebra than it did with the other Opal colors. Hmmm….I won’t be rethinking my hatred of entrelac, but those socks are pretty cool. I don’t see no stinkin’ ladders! Those socks are seriously cool! Those are awesome! I love how the entrelac looks with the stripey yarn. Wow! Love love love love the entrelac! Purrrrrty. Mm, I should learn how, one of these days…. How cool. I love the combination of the different textures. Wow! Those are awesome socks!! What a great combo! It sure made for much more interesting socks. Those are great socks! What a great use for the zebra! I have some entrelac mittens on the needles but I forgot how to do the technique so I have to get a refresher from my LYS – then maybe these socks! WOW! They’re gorgeous Ms ld! This really is the first time I love something made from Opal Zebra. These socks are so sophisticated. the entrelac is very cool. I want to try the pattern someday. How do I get the pattern? Do I get a magazine from Knitting Universe? Fabuloso dahling! Those make me want to cast on. Right. now. I’m in awe! What a great job and sophisticated KABOOM look. Those are so good looking! Another pair of socks I must knit. At least I’ve got the mag. How can I get the instructions? On the website that you have the link to only the recent designs are downloadable. I would love to make a pair like that….